To safely guide the flow of traffic through or around your work zone, we offer a wide variety of channelizing devices. 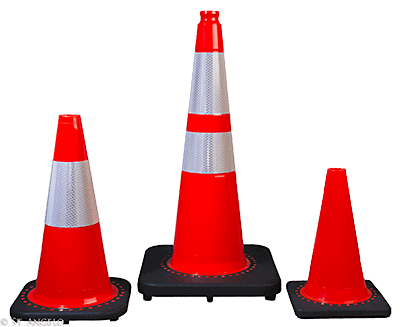 From delineators and permanently mounted posts to standard traffic cones and barrels, they can be used to create new lanes, block off construction areas, or direct traffic wherever you need it to go. Besides basic rentals and sales, we provide full-service solutions. We can help you determine which channelizing devices will work best for your project, and also set them up in a way that’s safe and compliant with all laws and regulations. For more information or to get a free quote, feel free to contact us. Stackable traffic barrels or drums. Navigators, lane dividers, vertical panels, & more. Both surface-mount channelizers & city posts. All sizes and colors. One shape.